Several years ago, I bought a cheap saddle stool for working on the computer, because I had been having problems with back pain. It was a fairly cheap copy of better made models, but it did the job reasonably well. Saddle stools are — as the name suggests — modelled on horse riding saddles, and maintain a more open angle between your torso and your thighs. They also tilt your pelvis in such a way that your back naturally assumes a more upright position. I found it quite comfortable, but also rather limited: it was fine for typing, but if you wanted to change position and lean back a bit (when reading from the screen, for example) there was no way to do that. Recently, my saddle stool became really uncomfortable because the foam padding had compressed severely, and a couple of bolts holding the seat to the base were digging into the back of my legs. I tried to fix it by adding extra padding, but that didn’t work properly, so I had to think about getting a new chair. For a short person like me, buying chairs brings with it the same trials and tribulations as buying clothes: nothing made for the ‘average person’ fits me. Of course, since very few people are actually ‘average’ most people have this problem in one form or another. I looked around at what was available, but most of the chairs had very limited adjustments available, so I knew immediately that they would probably not be comfortable. I also wanted something that would provide a bigger range of movement and seating positions, so that I could stretch out and move around at my desk. 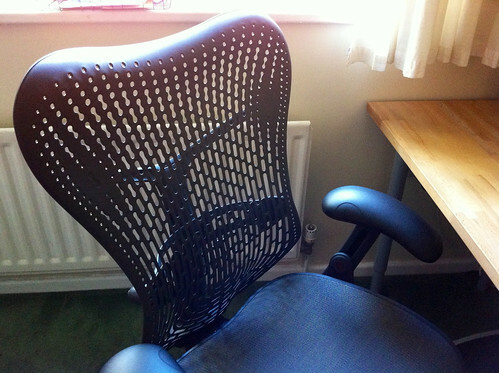 I’ve coveted a Herman Miller Aeron chair for ages, but I couldn’t find one at a reasonable price in the UK. Then I came across the Mirra chair, also made by Herman Miller. It had a great range of adjustments, and I managed to find a supplier that stocked it at a heavy discount from the recommended price. I thought about it for quite a while because it was still a lot of money, but I’ve been trying to avoid making false economies: buying cheap products often means that you end up spending the money again in a couple of years, and contributing to landfill along the way. I wanted a chair that would last many years, and since I spend a lot of time working at my desk it seemed like a good investment. The Mirra chair has an amazing 12 year warranty, so I could be fairly sure that it was going to last. In the end I ordered it, and I couldn’t be happier with it. Some of you may already have fancy adjustable chairs at work, but the chair I was provided with at work just has seat and back height adjustment, and that’s it. So I was amazed by how much difference it makes when you can actually adjust all the elements of the seat to fit your own body. The Mirra has adjustable seat height (of course), but the depth is also adjustable, which is really handy for people like me with short femurs (otherwise known as Stumpy Legs). You can change the height and width of the arm rests, and also their angle, so you can angle them in when typing, or tilt one out if you want to support your mousing hand. The lumbar support is very clever, and you can easily adjust the height and the depth of the support it provides. The Mirra also allows you to move around when you are seated. You can tilt back in the chair if you lean backwards, and almost recline it if you want. The resistance for this facility is adjustable so that you can balance it perfectly against your body weight. You can limit the range of tilting if you want to as well. I really enjoy the reclining, as I find I naturally raise my arms above my head and stretch backwards at intervals while I’m working, so the chair allows me to do that, but remain properly supported. Another aspect of tiling is the Forward Tilt: this tips the seat at a slight angle and places the backrest in a more upright position, which is perfect for keyboard work. You can engage this easily be leaning back slightly and then flipping a lever, and I find that as well as providing a comfortable postion, it also helps to mentally flip me into “writing mode”. It’s ridiculous really, but flipping a lever to change my seat position actually helps to remind me that I should be focussing on what I’m doing, like pressing a mental ‘Turbo Charge’ button. Sad, but true… The back is solid, heavy plastic, but the perforations provide both ventilation and a degree of flex. The seat is made from Herman Miller’s AirWeave material which is nicely supportive and flexible, but also allows ventilation. I’ve had to make a couple of other adjustments to my working set up. I have a desk made from a chunk of Ikea kitchen worktop with adjustable legs. When I originally set it up, I was using the saddle stool which naturally raises you up higher because your legs are more extended. Consequently, with my feet flat on the floor using the Mirra, the desk top was too high. I could have fiddled with the legs to lower the height of the desk, but when I measured it out, I realised that the desk would look as if it ought to be hosting small children in smocks for finger-painting activities. In the end I took the lazy (and vain) route of getting a cheap footrest instead of altering the desk. It works fine, but I might eventually lower the desk if I can withstand the mocking from visitors1. I’m really glad I decided to spend the money, because for me, the extra expenditure to get a chair that actually fits me (the first I have ever had that actually fits me) was worth it. It’s a solidly-made and very heavy chair, using good quality materials, and with the guarantee, I’m pretty sure that I’m going to be enjoying it for years to come.